Humanities: Genius Hour Completed- What A Show! 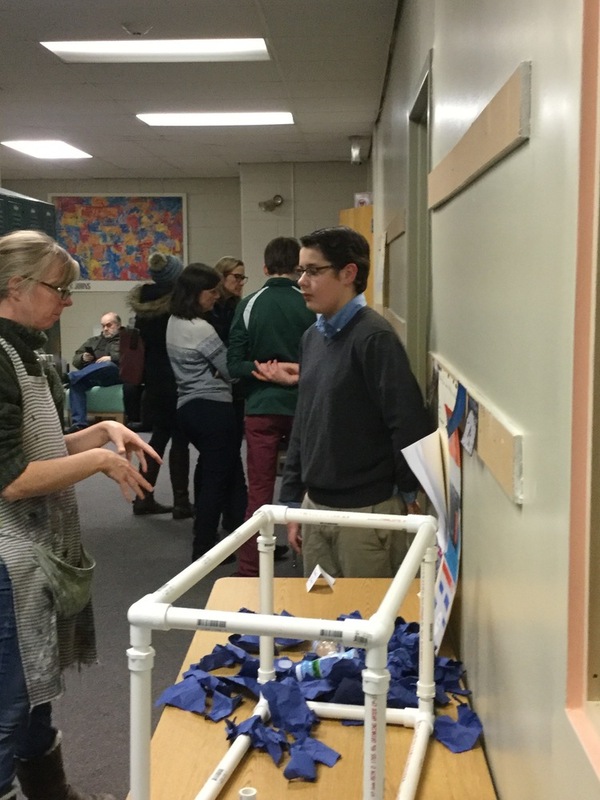 The 8th grade Humanities class displayed their Genius Hour projects last Tuesday night to rooms full of parents and students who were willing to brave the snowstorm to see what the next generation has in mind for solving the current generation's problems. Students' projects addressed a myriad of issues; plastic in the ocean, animal cruelty, wildfires, homelessness, teenage obesity, abuse, body image, roadkill, dependence on fossil fuels, disposable white board markers, disorganization in teens, anxiety in teens, texting while driving and composting. It was an evening filled with conversations and questions, as well as an opportunity to hear about the issues our Lyme School students feel passionate about. Particularly impressive was the ability of the 8th grade students to enter into intelligent, articulate conversations with the audience members about these real world issues. Nice job 8th grade and thank you to all who came out to support this exhibition.